Not that the release notes have any mention of it, but the Microsoft Office 2008 12.2.5 update will also install the latest Entourage EWS 13.0.5 if you had it on your hard disk already (else you get vanilla Entourage updated). You only need to install the stand-alone update if this is the first time you are installing the Exchange Web Services version of Entourage. This entry was posted in Blog and tagged installer, mac, microsoft, office on 9 June, 2010 by david. watchedinstall by Preston Holmes is a tool to monitor what files an installer actually installs. It works for pkg formats and most interestingly it works for custom install applications (i.e. InstallerVise reactionaries). Munki is Greg Neagle‘s suite for keeping a bunch of Macs up-to-date with a centrally managed software manifest. I literally dream about this kind of problem and how best to cover all the various things one wants to do when managing software on a Mac network. Somewhat bitter-sweet dreams. I think Macintosh management is interesting, but why couldn’t I have dreamt about girls? This entry was posted in Link and tagged installer, munki, watchedinstall on 19 July, 2009 by david. It’s not true, I don’t hate you, but the Adobe CS4 installer does. I was installing Adobe Creative Suite 4 today on a Macintosh. I had the amazing Adobe CS4 Master Collection media to install from, but all I needed was the Illustrator, InDesign, Photoshop and Bridge. So in the installation process I choose a custom install and de-select most everything except those applications. I un-ticked After Effects because I didn’t want to install After Effects. I un-ticked Soundbooth, I un-ticked Dreamweaver, I un-ticked all them other applications. The installation process begins. Finally it finishes. Afterwards I had Illustrator CS4, InDesign CS4, Photoshop CS4 and Bridge CS4 installed on my Mac’s hard drive. They all worked a treat. I also had a dog’s dinner of all the other flipping applications installed, all the applications I did not want to install, I had little vomit stains of Adobe installations that didn’t quite actually install, but installed. So for example I had a new folder in the Applications folder called “Adobe After Effects CS4” and inside there was an application named “Adobe After Effects CS4.app”. Except it isn’t an actual flipping application. It has a great big no entry icon on it because it isn’t an actual executable application. 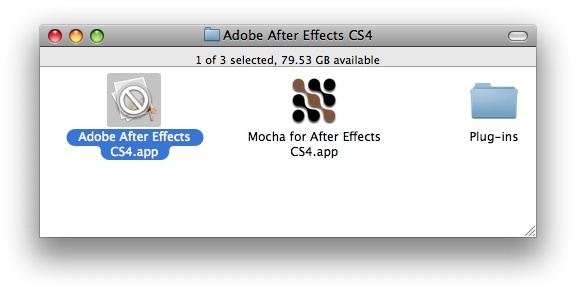 In one sense the installer did what I expected: it did not install a usable After Effects CS4. In another sense it effing ignored what I expected by creating an installation folder for After Effects CS4 and then created an incomplete stub of the After Effects CS4 application. I wish the Adobe CS4 installer had just done what I asked for. The Adobe installation and licensing blog is here. This entry was posted in Blog and tagged adobe, hateful, installer on 18 July, 2009 by david. The degree of hatefulness for a Mac installer often correlates to the degree of hatefulness for the software it installs. Adobe Creative Suite is this rule’s exemplar. 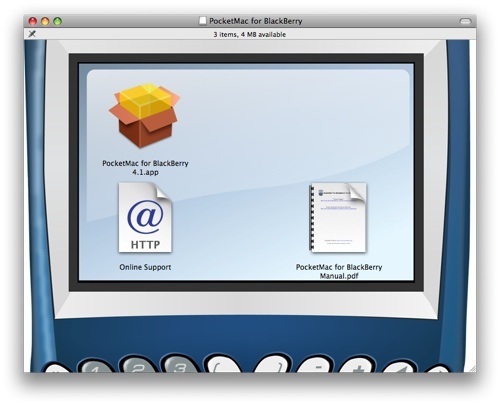 And if you have a Blackberry mobile phone you may have had fun trying to get the PocketMac for Blackberry software working. The PocketMac installation experience is pretty poor. Not surprisingly it uses Mindvision’s Installer Vise. But the developers have really pushed the boat out and gone to the trouble of using an Apple installer package icon for the install application. Do not be deceived! It is an application, not a package. And if you succeed in installing the sync application, don’t expect it to work unless you happen to have learnt that you should only connect the Blackberry to the USB cable after you have opened the sync application. This entry was posted in Blog and tagged hateful, installer on 18 June, 2009 by david. Whether you buy from Canon or Xerox (or Epson or Konica Minolta, etc. ), if you are buying a printer for heavy-duty use in a Mac design studio then it will probably have a Fiery RIP1 manufactured by Electronics For Imaging. There are lots of things to hate about Fiery RIPs. But right now I am going to hate their backward attitude to Mac driver installation. It is the year 2009 and this lot have yet to supply drivers as anything other than Installer Vise applications. So that means no simple command-line roll-outs with Apple Remote Desktop. That means no way of looking at the installation manifest ahead of installation. No way of having any confidence that the installer won’t screw everything up. To compound their sins, EFI like to give their installer applications a very pretty icon that looks just like a stylized Apple installer package. It is a very pretty icon of a box; a box full of hate. This entry was posted in Blog and tagged hateful, installer on 10 June, 2009 by david. Nice to see the installation process on Linux can be as misguided as it is on Mac OS X.
Chris Siebenmann’s blog, Wandering Thoughts. This entry was posted in Blog and tagged installer on 31 May, 2009 by david. Tweetdeck seems to be the path of least resistance for a desktop Twitter client on Mac OS X 10.4 (there are other free Mac desktop clients, Nambu and Tweetie but unfortunately they both require 10.5). But Tweetdeck requires the Adobe AIR runtime. And the Adobe AIR 1.5 installer takes Adobe’s favourite approach of ignoring Mac OS X’s package installer format in favour of a custom installer application. I read that as explicitly banning any efforts to create a package to ease the pain of deploying AIR across a bunch of Macs. Damn it. Clicking Accept moves you to the installation proper, and Adobe loses a few more points by immediately throwing up an authentication dialog box. Why does this dialog appear? What am I about to install? If only this was a package installer I could have looked at the installation manifest to get an idea of what was going to happen before granting the installer free rein to my computer. Turns out that everything you care about is installed in /Library/Frameworks/Adobe AIR.framework and /Applications/Utilities/Adobe AIR Application Installer.app and /Applications/Utilities/Adobe AIR Uninstaller.app. For some reason the installer also touches a couple of files in /Users/Shared/Library/Application Support/Adobe/AIR/Updater and slips a couple utility apps in your Library somewhere. You can ignore those. It feels particularly wrong when non-system applications put things in the Utilities folder – it is effectively a special system directory, and its contents are tools for tinkering with the system configuration or for diagnostics. Adobe Creative Suite 3 likes to create a folder Adobe Installers in there and Adobe Utilities, just in case you haven’t worked out how much you need their software on your computer. Heaven is almost certainly running System 6.0.8. Nothing is installed without Font DA Mover. This entry was posted in Blog and tagged adobe, hateful, installer on 23 May, 2009 by david.